Get ready for Cougar football in the fall, Coach Kevin Sumlin told UH Bauer alumni. Fresh from the Houston Cougars’ first workout of the season, University of Houston head football coach Kevin Sumlin told the UH Bauer College Alumni Association that he’s excited for the first game of the season on Sept. 3, where the team will take on the UCLA Bruins at Robertson Stadium. 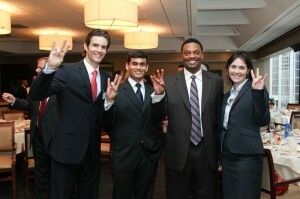 Sumlin was the second featured speaker of the Spring 2011 Bauer College Alumni Association Monthly Networking Breakfast series, held on Feb. 17 at Houston City Club. Presenting sponsor Jeb Bashaw, president and CEO of James E. Bashaw & Co., introduced Sumlin to the audience. 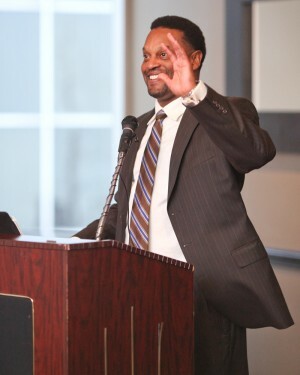 It might have been game night already judging from the smile on Sumlin’s face, as he spoke about the bright future of both the university and the athletics program and the excitement and potential for the upcoming season. With UH achieving a Tier One designation from the Carnegie Foundation and the NCAA granting quarterback Case Keenum an appeal to return for another year, the fall semester cannot come quick enough for Sumlin. Sumlin spoke about the improvement that both the team and the school has made and exciting new opportunities coming in the future, including a deal with Fox Sports that will give UH a set channel and a set game day of Saturday. But, progress is not a solo effort and change does not happen overnight, Sumlin added, attributing a great deal of the athletics program’s success and progress to its many partnerships and supportors, including UH System Chancellor Renu Khator, the UHS Board of Regents and UH Bauer. 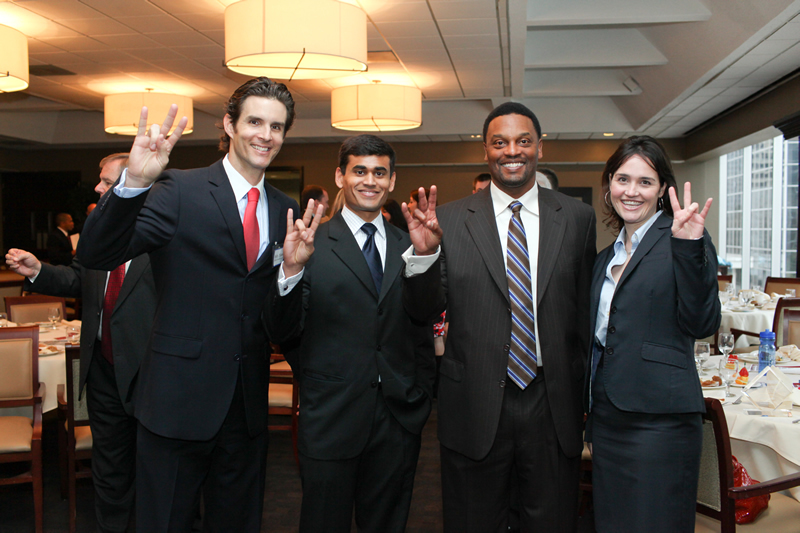 Held in the fall and spring, the BCAA Monthly Networking Breakfasts give UH Bauer alumni and students the opportunity to connect with each other and with local business leaders. Though last season presented unexpected challenges for the Coogs, Sumlin said the team is focusing on the new year, with new goals. Sumlin also spoke about the vision for a new stadium and the need to sellout home games, in order to compete with other universities within the conference and to bring more attention to the school. “I think that the best thing we can do as a university or a community, or as a business community, comes in terms of ticket sales,” he added. But in the end, for Sumlin, it is about the students both on and off the field. Presented by James E. Bashaw & Co., the BCAA monthly networking breakfasts are excellent networking opportunities that regularly attract strong attendance, with top leaders as speakers. In March, BCAA will host Colliers Appelt Womack President Patrick Duffy. For more information or to RSVP, click here.